Former Super Eagles goalkeeper, Vincent Enyeama, has commended the team and urged Coach Gernot Rohr to build for better days after their heartbreaking exit from the Russia 2018 World Cup on Tuesday. Nigeria were dumped out of the 2018 FIFA World Cup in Russia after they lost 2-1 to Argentina at Saint Petersburg, Russia. Argentina scraped through to the Round of 16 after Lionel Messi broke his drought at the tournament to give the two-time world champions the lead in the 13th minute. 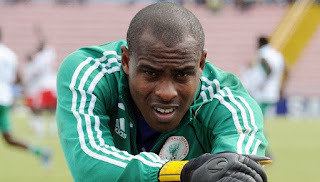 Vincent Enyeama It was the fifth time the Nigeria team was losing to Argentina at the World Cup. Victor Moses restored parity for the Super Eagles from the spot after Javier Mascherano was adjudged to have fouled Leon Balogun in the box. Marcos Rojo scored a stunning late winner three minutes from time to send Jorge Sampaoli’s side to the next round. Nigeria finished third in Group D with three points, one adrift of Argentina who nicked second spot with the victory. However, Enyeama tweeted on Wednesday “Naija forever. Win or lose. He said “Uzoho kept us in the game with the saves he made in the second half. We panicked in the first half,” as he analysed the game on SuperSport. Okocha added that “We were not clear to keep more players in attack. We were limited in terms of experience. On the controversial penalty denied the Super Eagles, the former Bolton Wanderers playmaker said the Nigerian team did not put more pressure on the referee. Marcos Rojo handled the ball in the box involuntarily and the referee viewed it on VAR but ruled it out. “Nobody appealed under the referee. We know what the Argentines are like. Rojo got away with one.” On Wilfred Ndidi’s chance in the 76th minute, Okocha said: “he had more time to keep the ball down to take a good shot. “Scoring is not his thing but I feel he should have kept the ball a close more to take a better shot.” On Odion Ighalo’s miss, Okocha’s said: “it was a glorious chance, the ball sat down well for him. If I was Ighalo, I would try to force a save from the goalkeeper. If you don’t hit the target you don’t get your job done.” Ighalo extended his goal drought to eight games. The Changchun Yatai striker has scored four goals in 21 games for the Super Eagles. On the late goal the team conceded, the former PSG play maker added: “We’ve seen so many late goals in this tournament. Poor defending. Moses reacted late. I have seen him deal with that at Chelsea. I can’t fault the effort of the player the gave their best. “It was going to be tough for us and it lived up to that and it went to the last three minutes, but I think we have to look at the bigger picture. Most of these players it was the first time. “For the manager he did well. It’s about continuity. We don’t have to point fingers at anyone,” he said.